Enjoy the sound of a quiet car again. If your exhaust system is broken, you'll have smelly and noisy problems. When you turn to Wayne's Auto Repair for exhaust repair, we eliminate the fumes and the nuisance. From the engine to muffler to the tailpipe, we provide comprehensive services. Ensure that your car's exhaust system is in perfect shape by coming to our exhaust repair shop in Powell, OH. How Do Exhaust Systems Work? A muffler literally muffles the noise from your engine. Without a fully operational muffler, you'd have a loud ride wherever you went. These sophisticated car parts provide sound dampening to minimize the noise coming from your car. 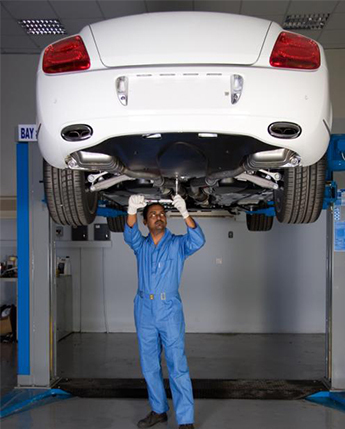 Our ASE-certified technicians are fully equipped and skilled at muffler and exhaust repair. We have the equipment and training needed to repair mufflers on cars of all makes and models. Upgrade your old or damaged system, and improve gas mileage at the same time. After all, an inefficient exhaust system also decreases fuel efficiency. Whether your old system needs repair or you simply want a new and improved one, you can rely on our auto technicians for complete exhaust system services. From the engine to the tailpipe, we replace and repair everything for cars and trucks, such as exhaust manifolds, oxygen sensors, exhaust pipes, catalytic converters, and mufflers. If you are leaving a trail of smoke behind you wherever you go, it's time to do something about it. Don't smoke out the other drivers on the road. Turn to our auto shop for exhaust systems repair and replacement. Repairing your exhaust system not only minimizes engine noise, but it prevents hazardous carbon monoxide fumes from polluting the air. Contact us for muffler and exhaust repair if smoke is billowing from your car's tailpipe. We proudly serve customers in Powell, Lewis Center, Delaware, and Dublin, Ohio.